Candidates on Monday rushed to file before the noon deadline. The Secretary of State's office set up desks in the lobby of the Memorial building to handle the crowd. New district boundaries, drawn by a panel of three federal judges for congress, Legislature and State Board of Education, set off a flurry of activity. TerriLois Gregory, a Republican, who moved over the weekend from the district she had represented to run in another district, signs paperwork Monday at the Secretary of State's office. 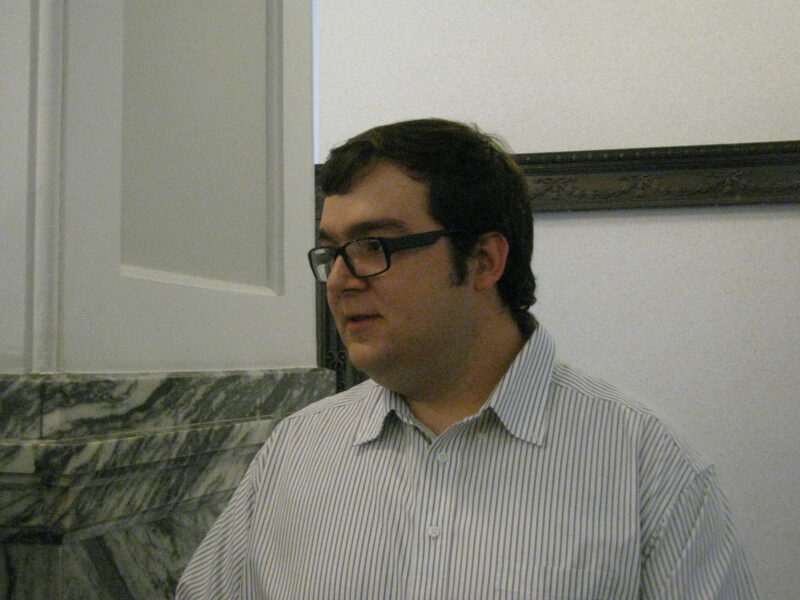 Caleb Correll, a Democrat from Ottawa, filed to run for the 59th State House District. Topeka ? On Friday, Robert Eye, an attorney from Lawrence, realized his residence was within the new 2nd Congressional District lines. 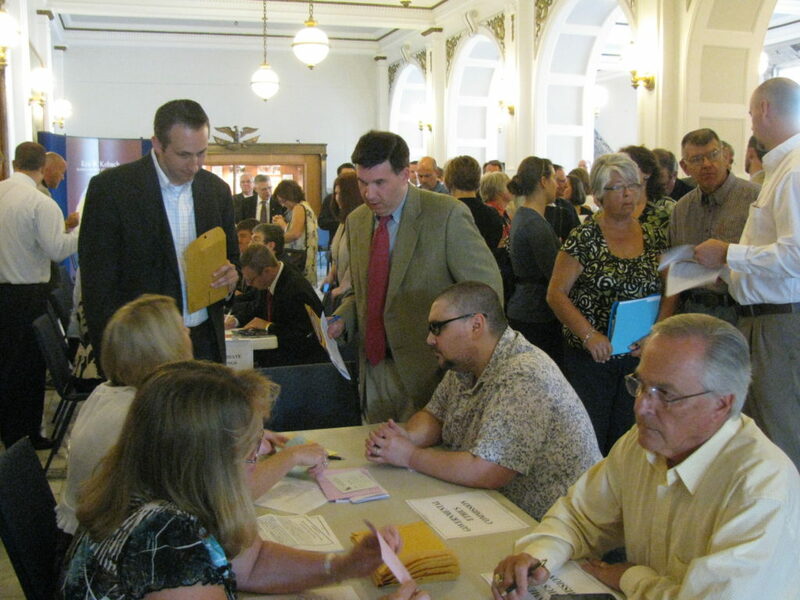 On Monday, Eye, who has been active for years in politics, was standing in a long line to file papers with the Kansas secretary of state’s office to run as a Democratic candidate for the district. “The country is in the midst of a lot of change,” Eye said. He said that every day Kansans need a representative who will speak for them and not the wealthy elite. 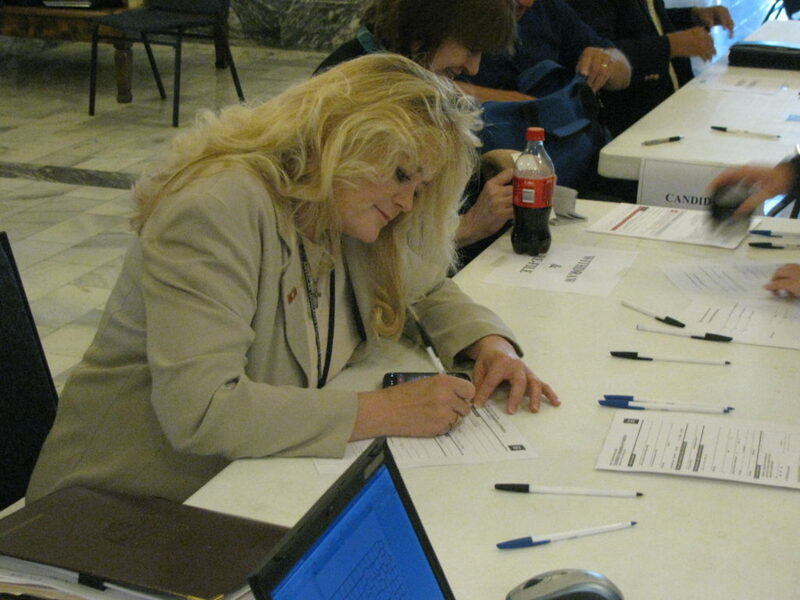 Eye was one of scores of people who converged on the Memorial Building to beat the noon deadline and file for newly drawn congressional, legislative and State Board of Education offices. The candidate scramble was unprecedented in Kansas history as a panel of three federal judges last week redrew political boundaries after the Legislature failed to accomplish the task during the 2012 session because of warring factions within the Kansas Republican Party. Kansas Secretary of State Kris Kobach, who had been critical of the panel’s maps, said the silver lining would be a lot of fresh faces in Kansas politics. After Kobach dropped the gavel to mark the end of filing, he said approximately 250 state House candidates and 100 state Senate candidates were in the running, in addition to nine congressional filers. State Rep. Jim Ward, D-Wichita, said the activity surrounding the filing of candidates was exciting. “All over the state, people are saying, ‘I can do this.’ People actually do believe in the system,” he said. Lawrence had been split for 10 years between the 2nd and 3rd Congressional Districts, but the judges placed it entirely in the 2nd. Now Eye will face Topeka minister Tobias Schlingensiepen and Scott Barnhart of Ottawa in the Democratic Party primary on Aug. 7. The winner faces U.S. Rep. Lynn Jenkins, R-Topeka, in the November general election. On the state legislative side, the new lines resulted in dozens of incumbents paired up in the same districts, and 25 House districts where there was no incumbent. The new boundaries prompted several legislators to retire, reassess and in some cases physically move to another district. In one of the oddest orchestrated shuffles, state Sen. Ray Merrick, R-Stilwell, filed to run for House District 27, and the incumbent House member, Charlotte O’Hara, R-Overland Park, will run for the Senate seat. To top that off, Merrick, who had previously served in the House, announced he will run for speaker of the House. Over the weekend, there was a premium on moving boxes as several legislators decided to pick up roots for more friendly political climes. Republican TerriLois Gregory had represented the 10th House District with a Baldwin City address. After the new map essentially split the district and placed it entirely in Douglas County, the conservative Gregory headed south. Gregory said she drove to Ottawa on Friday looking for “For Rent” signs and found a place to live. “The Lord moves you where he wants you,” she said. She is now running in the 59th House District. Gregory said she is ready to meet new voters. “I have my tennis shoes laced,” she said. Caleb Correll, a Democrat who filed for the 59th, described Gregory as a “carpet-bagger” who “abandoned her district to run in another district.” Correll, a liquor store manager, said he was born and raised in Ottawa and glad that Ottawa was now totally in one state House district. Two other candidates seeking the seat are Republican Blaine Finch and Democrat Stanley Wiles. Another legislator on the move was Melanie Meier, a Democrat from Leavenworth, who represented the 40th District. But the new map threw her residence into the 42nd District represented by state Rep. Connie O’Brien, R-Tonganoxie, who is also seeking re-election. So, Meier decided to move into the 41st District, which is represented by Jana Goodman, R-Leavenworth. Meier said she will be living across the street from a home that she is restoring. Meier said that might help her restore the house faster. • Anthony Brown, a Republican from Eudora and representative of the 38th House District, is running for the GOP nomination for the 3rd state Senate seat. Brown faces James Tellefson of Leavenworth for the Republican nod. State Sen. Tom Holland, D-Baldwin City, has filed for re-election. Under the new district lines, Brown had been thrown into the 10th House District. • Democrat John Wilson of Lawrence and Republican Erica Anderson of Baldwin City will face off in the 10th House District race. • State Rep. Barbara Ballard, D-Lawrence, drew an opponent in Republican Patrick Bengtson of Lawrence. Bengtson, 28, is a Lawrence High and Kansas University grad who received his law degree at the University of Pennsylvania. He said he has great respect for Ballard but believes it is time for someone new to represent the district. • Two Republicans, Jeremy Pierce of Lawrence and Ronald Ellis of Meriden, are vying for the Republican nomination to face state Sen. Marci Francisco, D-Lawrence. • State Sen. Anthony Hensley, D-Topeka, whose district takes in more of western Douglas County under the redistricting plan, will defend his position against the winner of the Republican contest between Casey Moore and Matthew Windheuser of Lawrence. • State Reps. Paul Davis, D-Lawrence, and Tom Sloan, R-Lawrence, drew no opponents. • U.S. Reps. Kevin Yoder, R-Overland Park, and Tim Huelskamp, R-Fowler, also drew no opposition in their respective districts.